When you look out into your backyard and you see the sheds that lie out there, do you ever think that it’s time to renovate and get a new one? That time is now and we have some of the best new workshops for the home you want. We have an excellent selection of potential workshops. All of them are fully customisable and these possibilities make it so the perfect one for you is fully within grasp. Starting at the base model, the single roller door workshop looks similar to our other garages. It is great for a single person, or small family, because it has compact space to store what’s needed and leave a little room for working. The next step up, the double door is nearly the same, but has two doors instead of one. This is better for a slightly larger family that has more items to store. In addition, the two-door design allows for a car or vehicle to be placed on one side, and storage and work on the other. If this kind of organisation is what you’re after, then the double rolling door shed with awning may be best suited for you. Here, you can place your car to one side and still leave the entire shed open for greater mobility with work and more space for belongings. Among storage sheds, the largest you’ll find for domestic use is the sliding door workshop. The design with the door allows larger machinery to easily enter the building, as well as provide for maximum storage. The best thing about our workshops is their customisable potential. All dimensions are chosen by you so that it can best suit the needs of your home. Not only can you replace the old shed in the back, you can bring in a new and perfectly fitting one in its place. Certain extras can also be added to your workshop, including skylights, dividing walls, and windows. In the event that anything happens to your new workshop, we provide a fifteen year cladding warranty and a ten year structural warranty. We want to make sure that your perfect workshop stays that way. 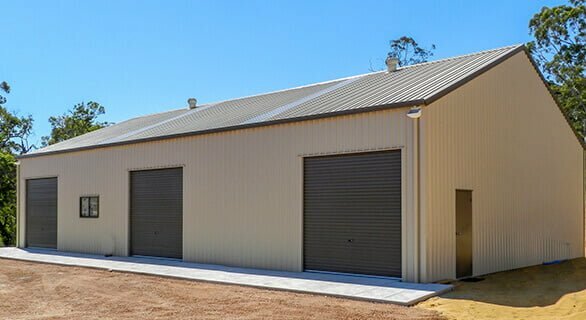 To learn more about our sheds, call 1300 778 628. Farmers – Are You Ready For A Rainy Day? Do You Need Council Approval For Your Shed?